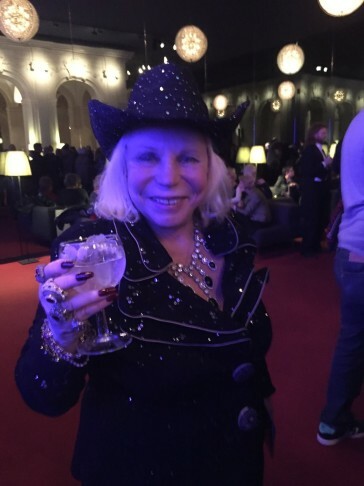 Truth be told: the performance of Turkish musical comedy star Serkan Kaya as a swaggering cowboy hero in Kalman’s Arizona Lady at the Komische Oper Berlin must rank as one of the most memorable operetta performances of the decade. Kaya gave a superstar reading of Kalman’s last operetta that was this year’s Christmas special at the Komische. Together with stage partner Katharine Mehrling he re-defined what operetta can sound like – and what it can look like. The popular young actor spoke to Alexandra Ivanoff and the Turkish newspaper Today’s Zaman about his operetta debut. Here is Ivanoff’s article on one of our heroes of 2014. The company [Komische Oper] is dedicated to the wide spectrum of opera repertoire, yet Kaya is actually not an opera singer. He is a self-described “pop-rock” vocalist, but his real claim to fame is that he’s one of Germany’s and Austria’s best-known young leading actors (speaking in both Turkish and German) of television, cinema and the live stage. 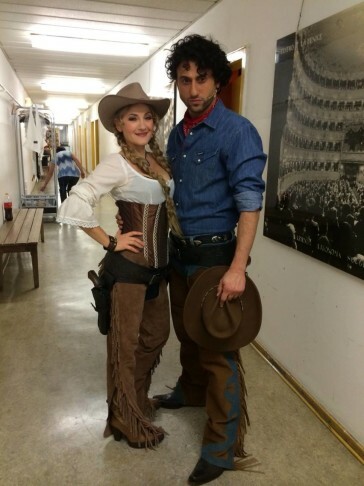 Kaya is slated to play the charismatic role of Roy Dexter, an American cowboy from Colorado, in the Berlin premiere of Hungarian operetta composer Emmerich Kalman’s (1882-1953) last stage work, Arizona Lady, written just before he died. What will make this production unique is not only its rarity, but director Barrie Kosky’s choice to mix opera singers and non-operatic types – a genre-bending approach he is fond of using. Kalman, if he were alive, would be happy with the mix. A composer who lived in several cities – Budapest, Vienna, Paris, Los Angeles and New York, ultimately settling in the last one – Kalman absorbed and then utilized those varied regional influences to transform operetta. 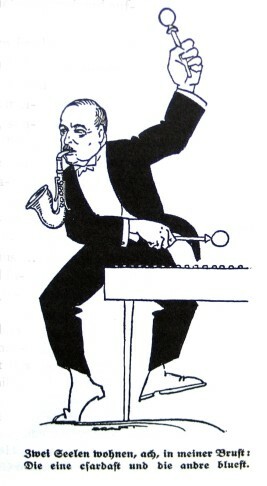 Caricature of Emmerich Kalman, “jazzing” it up in 1928. Kalman delighted in injecting America’s Jazz Age jitterbugs of the 1920s and Broadway-show styles of later decades into the more staid European tradition of Viennese operetta, whose only spicy musical element was generally the “czardas” (Hungarian folk dance). His general mashup of international references, despite critics’ sputtering that he was sullying the operetta genre, became his signature style that won hearts all over the globe and eternal fame in his native Hungary. 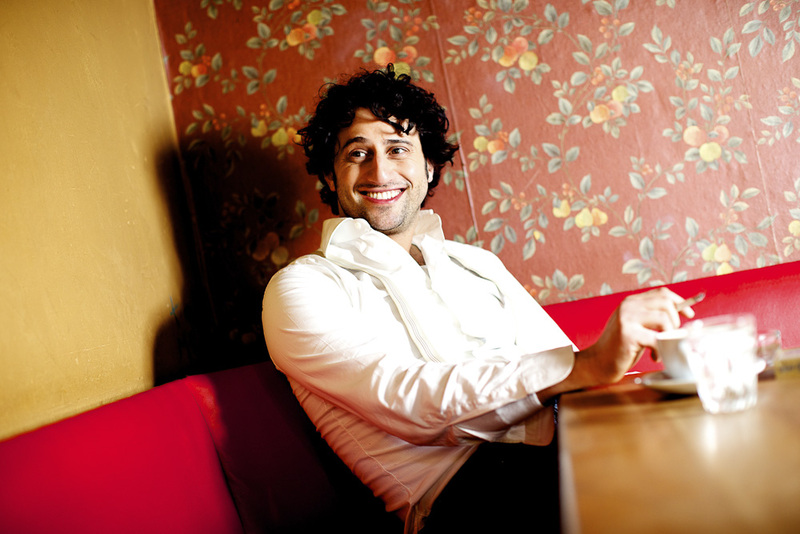 Kaya, in an exclusive interview with Today’s Zaman in Berlin, spoke about how this role is providing him with a unique opportunity in the middle of a highly successful acting career, and how his Turkish identity in Germany prepared him to face all kinds of challenges. “My parents came from Erzincan in the 1960s and settled near Köln, in Leverkusen, home to the Bayer pharmaceutical labs. As a result, I have a lifetime supply of aspirin!” he jokes. “I was the third child, but the first to be born in Germany. My parents were ‘Gastarbeiter,’ or guest workers from Turkey. Kaya made his professional debut in 2006 at the Aalto Theatre in Essen, and was later cast in a production of “Elizabeth” at Vienna’s Theater an der Wien, where he played an assassin. Poster design for “Hinterm Horizont,” the Udo Lindenberg musical playing in Berlin. In 2011, Kaya landed the leading role of Udo Lindenberg, the famous German rock singer, in the ongoing theater production Hinterm Horizont (Beyond the Horizon) in Berlin’s Theatre am Potsdamer Platz. Kaya is still performing the role, but on his own terms: His flexible contract allows him to step out for other assignments and then return to the role on a regular basis. From those pivotal productions, Kaya’s career jumped quickly to leading roles in television. On Vienna’s ORF channel, he plays a central character in the popular weekly series Die Detektive (The Detectives), as well as a current primetime comedy series on the VOX channel, Einfach Unzertrennlich (Simply Inseparable). Kaya expressed a desire to push his craft even further – into Turkey. As oddball luck would have it, one of Kaya’s two leading ladies – and the one the title refers to – is actually a female horse. It remains to be seen how Kosky and Kaya will spin that magic. Equine and all, from Budapest to Broadway with a dash of Turkish delight, Arizona Lady promises to be another lucky landing in Kaya’s career. If you want to read the original version of the article, click here. Yvonne Kalman dressed for the occasion. Love it!